On our calendar of events, where we list only those that might appeal to the Well-Met Man, we like to classify events by their appeal to men via activities, causes, drinks, or food. If you get more than two its a home-run must go event, and we just added on for January 31. 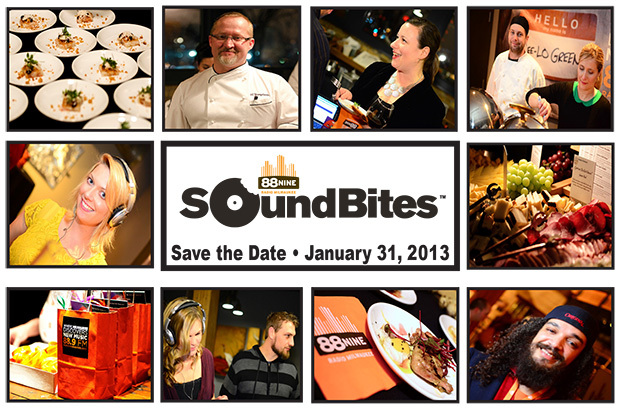 88Nine Radio Milwaukee's Soundbites is a music and food pairing event returns on January 31, 2013. Soundbites will be at The Iron Horse Hotel, a Well-Met favorite, from 5:30pm to 10pm. Watch top Milwaukee chefs team up with 88Nine DJs to create a tasting menu that pairs food selections with a perfectly matched musical accompaniment including Milwaukee's own Paul Cebar, who will provide the evening's musical vibe as the SoundBites guest DJ. You sample Wisconsin's finest cheeses and craft beverages provided by Great Lakes Distillery, Milwaukee Brewing Company, Stone Creek Coffee and Wollersheim Winery. Enjoy sampling these perfect pairings of food & music as you graze through chef-hosted tasting stations presented by the following restaurants, many of which themselves are Well-Met places. Because of this combination of music with food and drinks we give the event ¢, ≈, ƒ for a man friendly cause, drinks, and food. Admission is $125/person, with all proceeds to benefit 88Nine RadioMilwaukee. Limited tickets are available and last year's event SOLD OUT, purchase tickets here!